I’ve taken your typical fried chicken dinner and turned it into a healthy-ish salad. This Fried Chicken Salad has green beans and potatoes! Tomorrow is Fried Chicken Day. I have a #SundaySupper for tomorrow or else this would have been posted tomorrow instead of today. Now, this is one food holiday that I can’t pass up. Even with the new lower fat lifestyle we’re changing to, you can still have your fried chicken. Just not so much. It makes it even better if the fried chicken is surrounded by tasty, juicy, healthy veggies! That’s why I’ve made this Fried Chicken Salad; so I can have fried chicken and eat it, too!! My PEP person wasn’t too happy with the breaded chicken tenders I used. But, like I said, you can’t have fried chicken salad and it NOT be fried chicken. But, I did cut the amount, a mere 3 ounces per serving, and baked the frozen chicken tenders. If I was a little more organized, I would have made some baked chicken tenders, like these here. 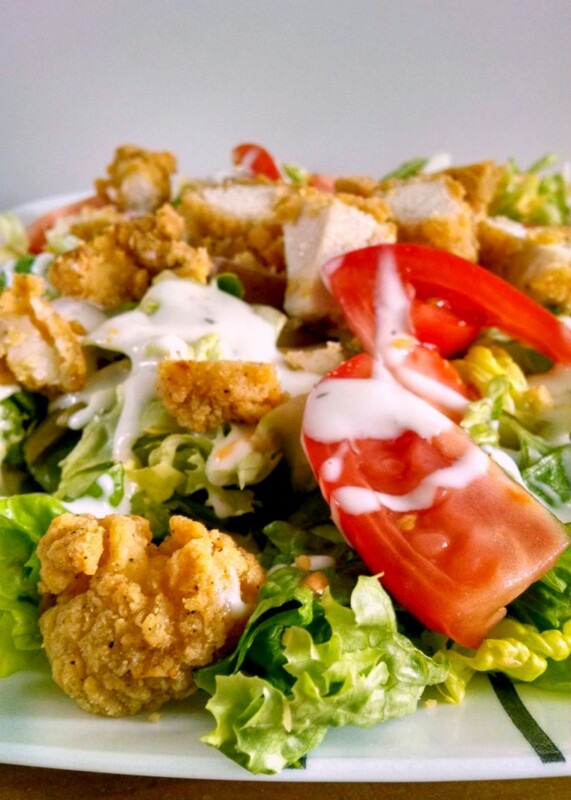 You can just see all the tasty flavors of this salad; the crunchy chicken, ripe tomatoes, crisp lettuce, crunchy onions. And there’s a few items you wouldn’t expect to see in there. Just think about it. What do you eat with a fried chicken dinner? Green beans? Potatoes? Yup! They’re in there!! I cooked up some potatoes and added it to the mix along with some cooked green beans. The goal was a fried chicken dinner in salad form. I know it’s a bit unconventional, but it does bring the comfort food taste in this salad form. I KNOW you want to dive right in there. Stab that juicy piece of chicken with your fork, dip it in the dressing and grab a bite of tomato. I know I’m ready to make this super simple salad again. I hope you try this fried chicken dinner in a salad for yourself. It’s super tasty! Bake chicken strips according to package directions. Divide the lettuce evenly between four plates. Top each plate with 1/2 cup boiled potatoes, 1/4 cup green beans, 1/4 cup onions, and 1/2 cup tomatoes. After the chicken strips have cooked, cool slightly before cutting into bite-sized pieces. Places 3 ounces of strips on top of each salad and drizzle with 2 tablespoons ranch dressing. This looks fabulous. Better than what you would get at the restaurant. Hope you have a great day! Your salad/meal looks yummy! I've never tried fried chicken on salad before, but it sure makes sense 🙂 Thanks for sharing on Wake Up Wednesday! I think you came up with a tasty and hearty salad. It really does make a fine main dish. Clever to add the beans. Well done. I pinned it. I love this! There is a place called Shane's Rib Shack in Raleigh that has a salad similar to this and it's amazing. Thanks for sharing. I hope your having a great Saturday.